Benjamin Jacob Huddle was born September 22, 1840 on a farm 3 miles east of Rural Retreat, Va. on the headwaters of the South Fork of Reed Creek. He was the sixth of 10 children born to David and Ruhama Brown Huddle. He married Callie Virginia Yost on Mar. 24, 1874. Daughter of Marshall Yost, she was born April 22, 1848 on a farm northwest of Wytheville, Virginia in the Doomfazle area between Hogback and Stoney Fork. Benjamin died November 29, 1916 at age 76, and his wife died on October 1, 1917 at age 69. They are both buried in St. Paul Lutheran church cemetery. At age 20 Benjamin volunteered for service in the Confederate Army on August 24, 1861, at Abingdon, Va. He was assigned to Company B, 29th Virginia Infantry, commanded by Colonel More, and remained in Company B throughout the four years of the war. The company was composed of boys from Wythe County and neighboring counties in southwestern Virginia. The company commanders were also local men. All during the four years of the war Ben carried a pocket diary 6" x 3 3/4" making daily entries of places he went, distances traveled, battles engaged in, and numbers killed, wounded and captured. The diary is badly worn and the ink faded in many places. It looks as though it was smattered many times with mud, water and blood. He recorded at least thirty battles and skirmishes he was in, including the siege of Richmond and Petersburg at war's end (May 1864 - April 1865), where southern Generals Pickett and Lee fought against northern Generals Sheridan and Grant. Most of the time they walked, or marched, and his entries show that he walked a total of 3,354 miles, rode the train 3,214 miles, and rode a buggy seventy miles, which was the last segment of his travel home after the war ended on June 25, 1865. Ben was wounded (shot through the hip) in his first battle, at Middle Creek, Floyd County, Kentucky, after which he went to the "doctor shop" (his words) in Russel County, Virginia and then to the hospital in Abingdon, and then home for three months to recuperate. He was again severely wounded, in the left arm, on March 31, 1865, at the Battle of Five Forks, during a bayonet charge in the siege of Petersburg. Following the battle he walked six miles and rested for the night. The next day he walked another six miles, and had his arm amputated. That same evening he walked another two miles, and got on the train to go to Farmville, where he was in the hospital for three months. When he was discharged on June 22, 1865, he rode the train to near Christiansburg, where a railroad bridge had been destroyed. His father met him there and took him the last seventy miles home in a buggy. After the war his father figured he could not make a living farming with only one arm, and sent him for some advanced schooling (perhaps an academy in Wytheville). He also operated a general store in Wytheville under the name "Huddle & Co." during late 1865, 1866 and 1867. 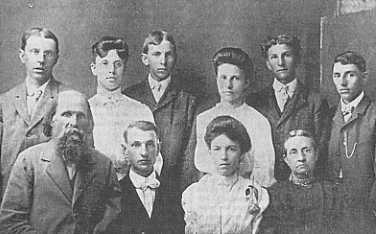 He later taught in several local schools, built a home and got married, and settled down to a successful farming career, and raised 7 children. He loved spirited horses, and taught all of his children to ride.